When my creative juices are feeling a bit stagnant or maybe every day life is just crowding out the ideas, I look at abstract paintings to get inspired. I’ve been busy creating a lot of landscape quilts and flower quilts and my heart and brain needed to work in a different design area. I found a beautiful painting of colors in curves. This painting inspired me to create the art quilt COLOR WAVES. 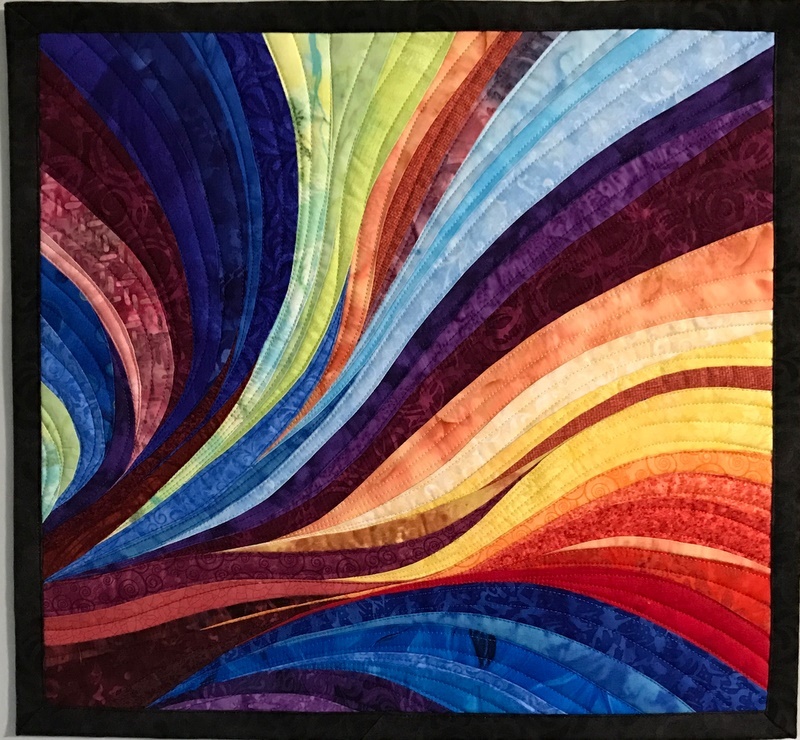 While I have made many quilts with curved piecing, this one was the first to create those curves so that they gathered together into very fine lines of color in several sections of the art quilt. Sewing all those different colors, which become more and more narrow, into some tight collections of color was a new experience. 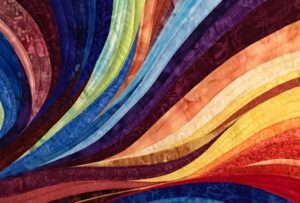 I realized the importance of piecing in a systematic way going from one direction to another across the quilt in a sort of sequence. By doing this, I could keep the seams more easily heading in the same direction and minimize the thickness of the seams. I started the piecing of this quilt with one of the larger peach curved pieces in the middle of the quilt. I added one piece at a time towards the bottom side and then added one piece at a time to the top side which continued around to the right side of the quilt. I can’t wait to try this design with different colors and some different swirl patterns!! There were a few times when I deviated from this sequence of piecing when there was a slice of color coming up from the lower right corner. As with all curved piecing, especially when the strips of fabric will eventually be quite narrow, I only cut one side of the curve on a much wider piece of fabric in my sewing process. This way you are working with wider, more stable pieces of fabric instead of very skinny strips. It is with the cut on the second side that you narrow the strip to its final size and shape (plus a seam allowance of 1/4″), ready to receive the next color piece. The finished size of this art quilt is 16″H x 17.5″W. Once I finished the piecing, I took photos of the quilt from all rotations to find the best view of the colors…that is, to figure out the best way to hang the quilt. I love the blast of movement the piecing creates from the bottom left to the top right from this view! Have fun trying curved piecing!